Santo Stefano di Sessanio is a fortified medieval village. It is located in the mountains of Abruzzo at 1250 meters above sea level, inside the Gran Sasso and Monti della Laga national park. The village is a classic example of an Italian medieval hill town, with perimeter walls encircling houses and squares. During the last century the “modernisation” of rural Italy compromised the architectural heritage of many of its countryside villages and towns. Traditional handcrafts are reflected in the detail: natural colours, woolen mattresses; cribs and handmade bedspreads woven on traditional looms. The restoration involves the retention of the original use of the domestic buildings. 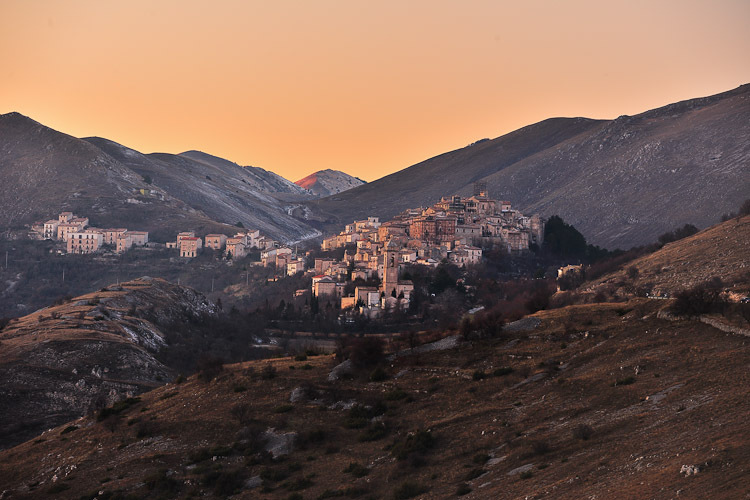 The project to conserve and revive Santo Stefano as an “albergo diffuso” involved a detailed plan to preserve the integrity of the village and its surrounding landscape. Working alongside local organizations such as the town mayor and the national park, we proposed special laws to prohibit any new construction. Our aim was to bring the village back to life and to welcome tourists,but without sacrificing Santo Stefano’s identity. To retain Santo Stefano’s local character all modern technology is hidden. We searched out original architectural materials, and our furniture and textiles are authentic items from the Abruzzo mountains. We have preserved traces of bygone countryside life in the fabric of the buildings – symbols of hardship which evoke the spirit of ancient rural life.